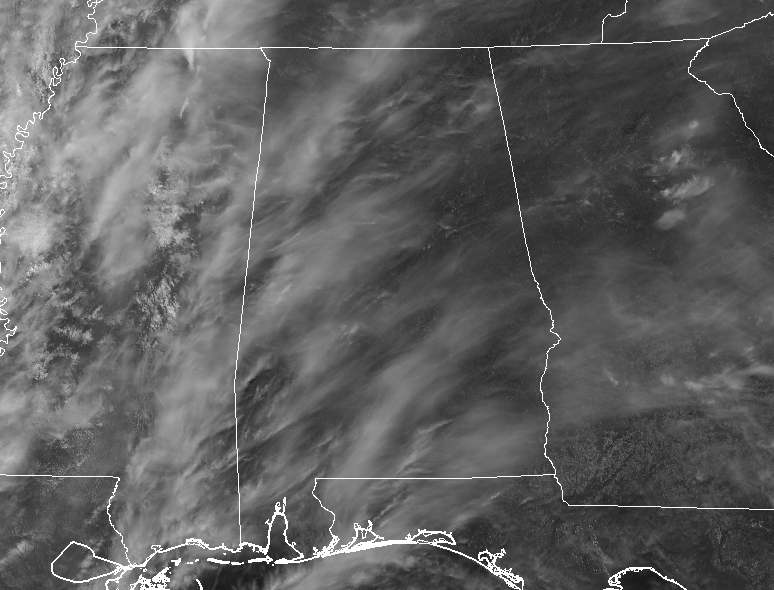 High clouds are moving in across Central Alabama from the storm system out to our west, but the good news is that there is no rain with those clouds. While much in the east is getting a decent amount of sunshine through those clouds, the western parts of the area are receiving a little less as the clouds are a little thicker. Temperatures at this time are in the lower to mid-70s across Central Alabama, with Birmingham sitting at 75 degrees. 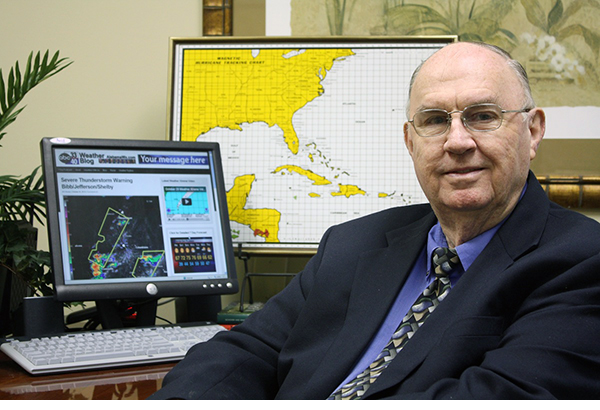 Uniontown is the warm spot at 76 degrees while the cool spot was Cullman at 71 degrees. 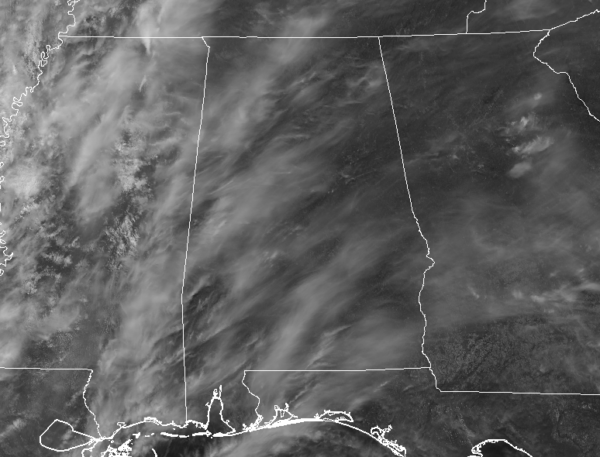 Clouds will continue to stream in from the west as a system begins to move closer to Central Alabama, making our skies mostly cloudy by the beginning of the evening hours. We’ll stay dry as our air is just too dry at this point, and afternoon highs will make it up into the upper 70s to the mid-80s. Skies will be mostly cloudy to completely overcast throughout the overnight hours, with lows only dropping into the upper 50s to the lower 60s. A very dynamic system is getting its act together today, bringing severe weather across the Plains states and will bring the potential for severe weather to Central Alabama on Thursday. SPC has the western half of Central Alabama in an Enhanced Risk (level 3 of 5) on their day 2 outlook graphic (valid 7:00 am Thursday through 7:00 am Friday), while the eastern half in a Slight Risk for severe storms. Tornadoes and damaging winds up to 60 MPH will be the main threats, while quarter-size hail is possible but will be a much smaller threat. The main window across the area for severe storms will be from 4:00 pm Thursday to 4:00 am Friday, but usually with type of system, it will move across faster than expected, so go with the earliest times on the graphic above. At this point, the higher tornado threat will be over Mississippi throughout the afternoon hours, but as the system moves into the area. The limiting factor in this system will be the dry air that is currently in place. It may take a while for moisture to work into the area and may only make it as far north as the southwestern parts of the area. There will be decent shear in place over the northern parts of the area, so where those two meet will be the locations we’ll need to watch for tornado development, especially in Greene, Hale, Marengo, Dallas, Sumter, and Perry counties. A few tornadoes will be possible over the rest of the area but the risk level will be lower than those previously mentioned counties. 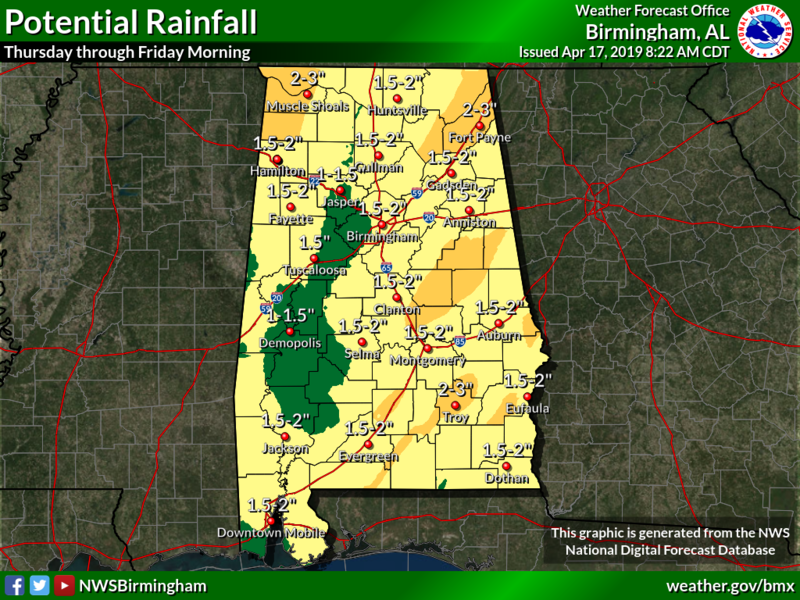 Rainfall amounts for Central Alabama through Friday morning should end up in the 1.00-2.00 inch range, which should keep any flash flooding chances very minimal. May have ponding and some water in poor drainage areas. Afternoon highs will be in the mid-70s to the lower 80s. 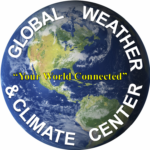 James will have his afternoon Weather Xtreme Video out by 4:00 pm, and I’ll have another brief severe weather update later this evening before 8:00 pm. 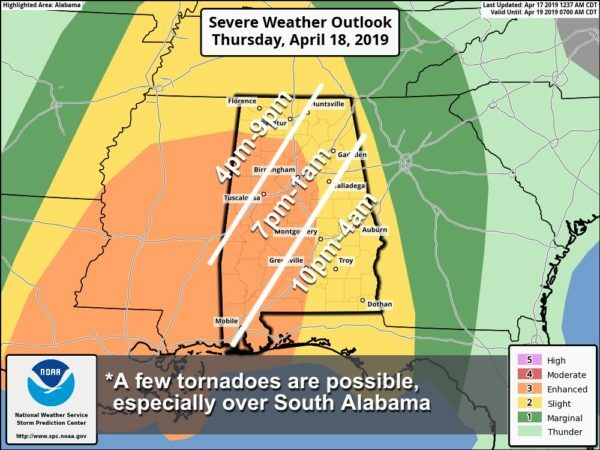 We’ll also have updates throughout the day on Thursday and into the overnight hours on Friday morning until the severe weather threat comes to an end. Have your severe weather emergency kits ready to go and your severe weather safety plan talked-over and ready to enact if your location goes under a warning tomorrow evening. 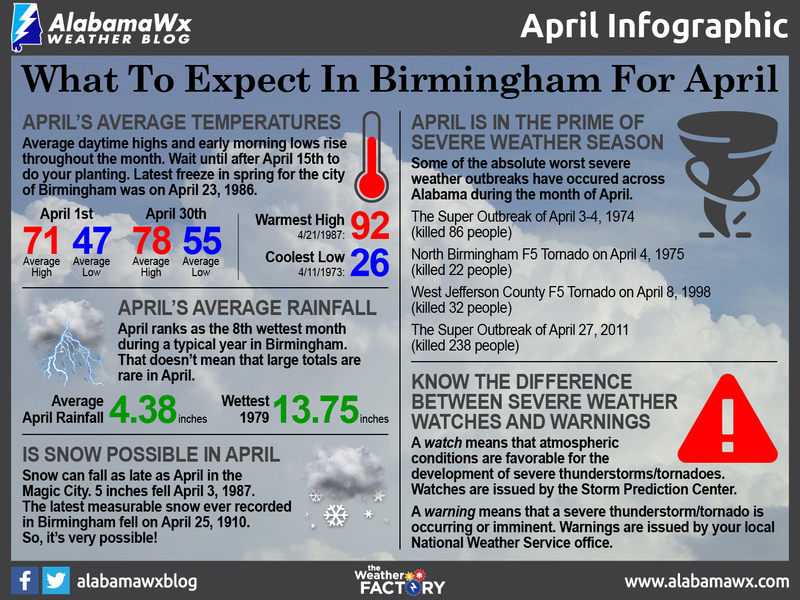 Have multiple ways to receive weather warnings: an NOAA WeatherRadio, WEAs activated on your phones, a great weather warning app like MyWarn or the FEMA app, and have the ABC 33/40 app downloaded so you can watch live coverage from your safe place.